When the itchy red spots of childhood chickenpox disappear and life returns to normal, the battle with the virus that causes chickenpox seems to be won. But for all too many of us this triumph of the body's immune system over the virus that causes chickenpox is only temporary. 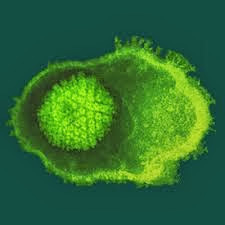 The virus has not been destroyed, but lays low, ready to strike again later in life. This second eruption of the chickenpox virus is the disease called shingles. Scientists believe that in the original battle with the chickenpox virus some of the virus particles leave the skin blisters and move into the nervous system. There the viruses settle down in an inactive (latent) form inside specific nerve cells (neurons) that relay information to the brain about what your body is sensing — whether your skin feels hot or cold, whether you've been touched or feel pain. These lie in clusters (ganglia) adjacent to the spinal cord and brain and are one type of sensory neurons. When the chickenpox virus reactivates, the virus moves down the long nerve fibers that extend from the sensory cell bodies to the skin. The viruses multiply, the telltale rash erupts, and the person now has herpes zoster, or shingles. With shingles, the nervous system is more deeply involved than it was during the bout with chickenpox, and the symptoms of shingles are often more complex and severe. The virus responsible for shingles and chickenpox belongs to a group of viruses called herpesviruses. This group includes the herpes simplex virus that causes cold sores, fever blisters, mononucleosis, genital herpes — a sexually transmitted disease, and Epstein-Barr virus involved in infectious mononucleosis. Like the shingles virus, many other herpesviruses can take refuge in the nervous system after an individual has suffered an initial infection. These viruses may remain latent for years, then travel down nerve cell fibers to cause a renewed infection. The varicella-zoster shingles virus looks as though it were designed by a mathematician. It is a microscopic sphere encasing a 20-sided geometric figure called an icosahedron. Inside the icosahedron is the genetic material of the virus, deoxyribonucleic acid (DNA). When activated, the shingles virus reproduces inside the nucleus of an infected cell. It acquires its spherical wrapping as it buds through the nuclear membrane. Who is at Risk for Shingles Virus? About 10 percent of normal adults can be expected to get shingles during their lifetimes, usually after age 50. The incidence increases with age so that shingles is 10 times more likely to occur in adults over 60 than in children under 10. Most people who get the condition develop immunity to the shingles virus and will not get the disease again, however, shingles may recur in some individuals. These cases usually involve people with declining or compromised immune systems, such as those infected with HIV or receiving chemotherapy. A person who is suffering from a disease that damages the immune system, or who is taking anticancer drugs that suppress the immune system, is a prime candidate for an attack of shingles. Even among healthy individuals, temporary depression of the immune system because of stress, a cold, and even sunburn may be associated with an attack of shingles. Youngsters whose mothers had chickenpox late in pregnancy — 5 to 21 days before giving birth — are also vulnerable to shingles. Sometimes these children are born with chickenpox or develop a typical case within a few days (see section entitled "Do Women Have Special Risks from Shingles" for more information). The first sign of shingles is often burning or tingling pain, or sometimes numbness, in or under the skin. The individual may also feel ill with fever, chills, headache, or stomach upset. After several days, a rash of small fluid-filled blisters, reminiscent of chickenpox, appears on reddened skin. The pain associated with shingles can be intense and is often described as "unrelenting." People with lesions on the torso may feel spasms of pain at the gentlest touch or breeze. The blisters are usually limited to a band, called dermatomes, spanning one side of the trunk, around the waistline, or clustered on one side of the face. The distribution of the shingles spots is a telltale clue to where the chickenpox virus has been hiding since the initial infection. Scientists now know that the shingles lesions correspond to the dermatome supplied by a specific sensory nerve that exits from the brain or spinal cord. For the majority of healthy individuals, this second bout with the chickenpox virus is almost always a second triumph of the body's immune system. The shingles attack may last longer than chickenpox, and the patient may need medication for pain, but in most cases the body has the inner resources to fight back. The lesions heal, the pain subsides within 3 to 5 weeks, and for most patients the blisters leave no scars. The severity and duration of an attack of shingles can be significantly reduced by immediate treatment with antiviral drugs, which include acyclovir, valacyclovir, or famcyclovir. Antiviral drugs may also help stave off the painful aftereffects of shingles known as postherpetic neuralgia (see section entitled "What are the Complications of Shingles?). Doctors now recommend starting antiviral drugs within 72 hours of the first sign of the shingles rash. Early treatment is believed to reduce the risk of postherpetic neuralgia and may speed up the healing process. Other treatments for post-herpetic neuralgia include steroids, antidepressants, anticonvulsants, and topical agents. Scientists continue to work toward developing newer antiviral agents and more effective pain killers. Do Women Have Special Risks from Shingles? Many mothers-to-be are concerned about any infection contracted during pregnancy, and rightly so. 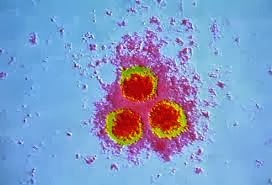 It is well known that certain viruses can be transmitted across the mother's bloodstream to the fetus, or can be acquired by the baby during the birth process. Maternal chickenpox poses some risk to the unborn child, depending upon the stage of pregnancy during which the mother contracts the disease. During the first 30 weeks, maternal chickenpox may, in some cases, lead to congenital malformations. Such cases are rare and experts differ in their opinions on how great the risk is. If the mother gets chickenpox from 21 to 5 days before giving birth, the newborn may have chickenpox at birth or develop it within a few days, as noted earlier. But the time lapse between the start of the mother's illness and the birth of the baby generally allows the mother's immune system to react and produce antibodies to fight the shingles virus. These antibodies can be transmitted to the unborn child and thus help fight the infection. Still, a third of the babies exposed to chickenpox in the 21 to 5 days before birth develop shingles in the first 5 years of life because the shingles virus must also be fought by immune cells. What if the mother contracts chickenpox at precisely the time of birth? In that case the mother's immune system has not had a chance to mobilize its forces. And although some of the mother's antibodies will be transmitted to the newborn via the placenta, the newborn will have precious little ability to fight off the attack because the immune system is immature. For these babies chickenpox can be fatal. They must be given "zoster immune globulin," a preparation made from the antibody-rich blood of adults who have recently recovered from chickenpox or shingles. As early as 1909 a German scientist suspected that the viruses causing chickenpox and shingles were one and the same. In the 1920's and 1930's the case was strengthened. In an experiment, children were inoculated with fluid from the lesions of patients with shingles. Within 2 weeks about half the children came down with chickenpox. Finally in 1958 detailed analyses of the viruses taken from patients with either chickenpox or shingles confirmed that the viruses were identical. This study also proved that a person with shingles can pass the virus to individuals who have never had chickenpox, but these individuals will develop chickenpox not shingles. A person with chickenpox cannot communicate shingles to someone else. In order for people to develop shingles they must already harbor the virus in their nervous system, and for those who do harbor the shingles virus, having contact with someone with chickenpox will not trigger shingles. Additionally, a person with shingles cannot communicate shingles to another individual. Shingles is a serious threat to life in immunosuppressed individuals — for example, those with HIV infection or patients with cancer who are receiving treatments that can weaken their immune systems. These treatments destroy cancerous tissue but unfortunately they also have the potential to damage cells of the immune system that normally fight invading organisms. Patients who receive organ transplants (for kidney disease, for example) are also vulnerable to shingles. To prevent the body from rejecting the foreign tissue of the transplant, these patients are given drugs that suppress the immune system. 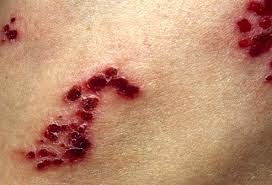 Should any of these patients contract shingles, there is a possibility that the zoster shingles virus will spread throughout the body, reaching vital organs like the lungs. If unchecked, such disseminated zoster can lead to death from viral pneumonia or secondary bacterial infection. What are the Complications of Shingles Virus? People with "optical" shingles (where the shingles virus has invaded an ophthalmic nerve) may suffer painful eye inflammations that leave them temporarily blind or impair their vision. Individuals with this type of shingles should see an ophthalmologist immediately. If shingles appears on the face and affects the auditory nerves, it can also lead to complications in hearing. Infections of facial nerves can lead to temporary paralysis. 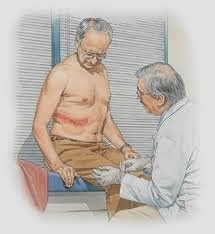 Sometimes, particularly in older people, symptoms of shingles persist long after the rash is healed. In these cases, facial paralysis, headache, and persistent pain can be the aftermath. Possibly because the nerve cells conveying pain sensations are hardest hit, or are exquisitely sensitized by the shingles virus attack, pain is the principal persistent complication of shingles symptoms. This pain, called postherpetic neuralgia, is among the most devastating known to mankind — the kind of pain that leads to insomnia, weight loss, depression, and that total preoccupation with unrelenting torment that characterizes the chronic pain sufferer. Although it can be extraordinarily painful, postherpetic neuralgia is not life-threatening. Doctors treating the pain currently employ a variety of medications. Powerful narcotic pain relievers can offer relief but, because they can have serious side effects, doctors often prescribe newer nonaddictive but potent painkillers. Ointments containing capsaicin, the heat-producing ingredient found in hot chili peppers, are effective in relieving pain from postherpetic neuralgia, as well as pain from other disorders such as arthritis. Such ointments are currently available by prescription. Although these creams contain less than 1 percent capsaicin, new research suggests that patients may be able to tolerate creams containing 5 to 10 percent of this active ingredient if used in combination with other pain killers. More research is needed before these higher dose ointments will be available to patients with postherpetic neuralgia (see section entitled "What Research is Being Done?"). In 1999, the Food and Drug Administration approved a new method of treating the pain of postherpetic neuralgia. The product is an adhesive patch containing lidocaine, a commonly used local anesthetic. The patch allows lidocaine to be released into the top layers of the skin, reducing pain from the damaged nerves. Because it delivers the drug via the skin, it does not produce any significant levels of the drug in the blood and, therefore, does not cause serious systemic side effects if used appropriately. Studies have also shown that some anticonvulsant drugs used to treat epilepsy, such as carbamazepine, are sometimes effective in relieving the pain of postherpetic neuralgia. Antidepressants can help also. In addition to their effects on mood, the antidepressants appear to relieve pain. Some doctors report that patients occasionally benefit from alternative treatments for pain, such as acupuncture and electrical stimulation of nerve endings. It is important to realize that individuals with postherpetic neuralgia no longer have shingles: their infection is over. Instead, they are suffering from damage to the nervous system. Scientists believe that the shingles virus attack has led to scarring or other lesions affecting the cells in sensory ganglia and associated nerves. Even in such severe cases, however, the paralysis, headaches, and pain generally subside, although it may take time.